Wood Framing Wall makes wood framing of walls fast and easy with real-time full project updates in Revit®. Plus it generates views with automatic dimensions for wall panels or segments as well as accurate bills of materials and shop drawings. So quality production and accurate assembly on site are ensured. Connectors, cuts, supports, and other details can be distributed based on predefined rules or connection types. They can then be modified or updated to suit the project design stage and the level of detail required. Wall frames and the layout of frame elements and details can be modified and updated whenever the project is changed. Dynamic update functionality can make changes to all walls frames of the same type at once. Wall frame elements in the project can be easily marked based on their properties and locations in the wall layer. And information for fabrication can be automatically generated with all desired views, schedules, and drawings for each wall panel. 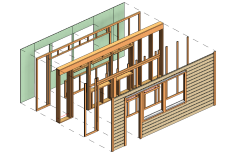 Automates wood framing work with walls in Revit® projects. Powerful, flexible, and easy to use. It helps you make optimal choices, move much faster, and avoid errors at every BIM stage – from design and documentation to wall segment fabrication and construction. A powerful add-on for managing walls in Revit®, letting you rapidly disassemble layers into different wall types, fully control joins and gap distances, split walls into separate panels with predefined settings, insert gravity points, and manage information with an export-to-Excel feature. Saves Lots of Time. Wood Framing Wall is built for quick project development. 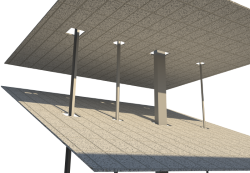 Standardized and automated wall framing and workshop drawing generation enables users to jump over a few major steps in building design. Shop Drawings on the Go. Shop drawings are produced almost at the same time you frame your first wall. Easy to make templates allow user to forget about this process. Check if everything is alright at the end, adjust few things, and you’re ready to deliver your project. Easy-to-Use User Interface. Everything in Wood Framing Wall is a mouse click away. Choose what needs to be modified and click the function which is comfortably listed in easily operated menu. Workflow was tested with untrained professionals who helped to optimize and find the perfect solution for you. Completeness does the modelling of framing, tagging of elements, dimensioning and scheduling with single solution. Complete the process in one place. The custom join tool has a really nice user interface. I’ve used one in the past that ended up being trial and error because the UI didn’t help the user understand what changes they were making. I’m happy to report that I was able to adjust my first join within minutes! I was also glad to see the preview adjust with each change and how each item drop down option made sense with how the items moved. Great solution, I’m excited to set it up in my project! Your team does great work! - Chandel Ninmann, Virtual Design/Construction Specialist at United Building Solutions, USA. Wood Framing Wall is brought to you by AGACAD. Pricing was not known at press time.